I confess to being proud of my family and so when someone in the clan writes a book, I read it with great pleasure. My brother-in-law, William Landay, recently released his third book, the crime thriller Defending Jacob, to great critical reviews and it has become a NY Times Bestseller. And my uncle Ezra Vogel recently released a towering biography of Deng Xiaoping, which beat out Kissinger's book on China for the prestigious Gelber Prize, which is awarded to the best book on foreign affairs each year. 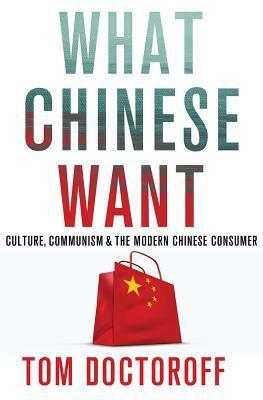 So when my cousin, Tom Doctoroff, released his second book on China, What Chinese Want, I was excited to read it. Somewhat to the chagrin of the rest of the family, Tom left America for China 20 years ago to be an executive for advertising agency JWT (one of the WPP holding companies). He quickly rose to become CEO of Asia for JWT and from that perch has witnessed the cultural transformation and consumerisation of the country. "Put simply, the Chinese are great at application but lousy at innovation…The Chinese are defensive and protective, are culturally and institutionally averse to ideas that buck convention." I also enjoyed his observations about China's relationship with the United States. "The Chinese do not want to beat the US," he writes as if trying to assure policymakers and the broader American society at large, "They want to stand beside it, proudly." This attitude is rooted in the Chinese adherence to Confucian principles of harmony and the principle of being "ambitious, yet cautious to the core". His explanation of China's fascination with president Obama was also telling, observing that Obama's "underdog status became a font of admiration," and that by reshaping the US political power structure as an outsider he "achieved what a sometimes-insecure China aspires for itself". Tom's observations on Chinese culture, board room behavior, international affairs and consumerism are that rare insider's view provided by an able reporter who is steeped in American culture and values. If you want to learn about the motivations and mores behind the next great global force, read this book. One of the most frequent questions I get from entrepreneurs is "what is market?" with regard to compensation, particularly for executives such as the Chief Technology Officer or VP of Sales. It is such a frequent question that it was the topic of one of my first blog posts 7 years ago. Talent is the most important ingredient at a young company, and so there is great energy put into trying to be thoughtful to pay a fair market rate for good talent, particularly in light of a very competitive market. Fortunately, like most things in the land of startups, the world has gotten much more transparent in the last few years and there's a plethora of good data available to help answer this question. One of the best is my Harvard Business School colleague Noam Wasserman's annual compensation study that he performs in partnership with J. Robert Scott and E&Y. Noam describes the study a bit in his blog post, but if you want a far more detailed view of "what is market" than my amateur summary – sliced and diced by industry, size of company, amount of capita and more – then this study is for you. It's a give-get model – if you give your data, you get the aggregated data back in all it's gory detail. Are Banks Simply Too Big To Innovate? Mary Meeker's periodic review of the Internet industry is always a must-read presentation. This year was no exception – chock full of data, insights and thought-provoking charts. There is a theme that Mary espoused that I have become a big fan of ever since I read Marc Andresseen's article in the Wall Street Journal "Why software is eating the world." She framed it as the "re-imagination of nearly everything." The simple notion is that the confluence of broadband, mobile and globalization in combination with Moore's Law have allowed the technology industry to innovate almost everything in existence. Facebook's IPO brought their "hack" culture to the forefront of the world's conscience. Well it turns out, technologists are hacking everything – from advertising to media, from retail to health care, from education to banking. Ah, banking. This has not been a good few weeks for the banking industry. The surprise $2 billion trading loss at JP Morgan Chase has caused erstwhile superhero Jamie Dimon to appear fallable. Many are pointing out that the crisis at JP Morgan is an example of a banking sector that is increasingly concentrated in the hands of a few and results in a systemic risk because the top 5 banks are simply "too big to fail." I would argue, there is an even larger risk for the financial services industry, that in turn provides a larger opportunity. I think banks are now simply too big to innovate. 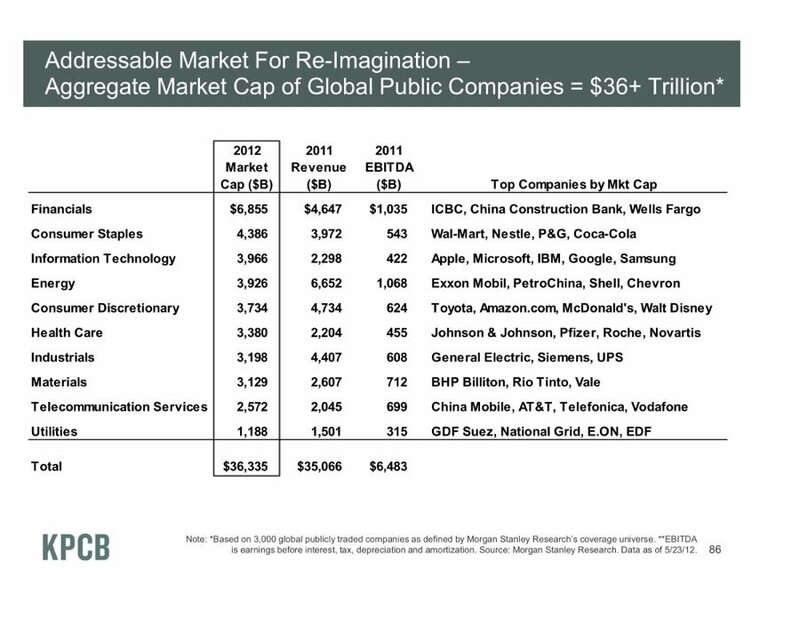 She lists the industries that are ripe for "re-invention" sorted by their 2012 market capitalization. Financials are on top at a leviathan-like $7 trillion. There are 200,000 employees at JP Morgan Chase and Bank of America each and 350,000 at Citigroup. Structurally speaking, these organizations are simpy too large to develop breakthrough, out-of-the-box, re-invent banking solutions. That opportunity is left to entrepreneurs. As a result, there are a slew of start-ups "hacking" banking. We have invested in a number of them that are hacking away at pieces of the financial system. ZestCash is hacking consumer lending. SimpleTuition is hacking student loans and banking. Cartera Commerce is hacking credit card marketing. AccountNow is hacking checking accounts and debit cards. Plastiq will soon be hacking large ticket purchasing. There are hundreds, if not thousands, of others that other investors have backed as well. So when I look at the innovative progress being made in payments, mobile banking and other major areas, it makes me smile. Because while the major titans in the industry are caught up in looking backwards, the entrepreneurs are re-inventing the future of finance. That's an exciting prospect.